Visualise riding jackets & riding gloves are worn to improve a rider’s position in the saddle. Utilized by equestrian coaches and trainers the Visualise Training jacket and horse riding gloves help with the biomechanics analysis of a equestrians position. 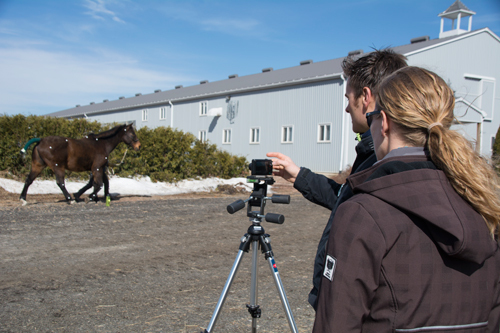 Visualise Sportswear Canada is designed by a leading equine biomechanics expert, Russell Guire of Centaur Biomechanics. Designed to improve rider biomechanics, awareness and balance with equine partners. Biomechanics for Horse Riders. Visualise Sportswear training jackets, & gloves allow you to see at a glance & change any postural weakness. Trainers & coaches use Visualise Sportswear training jackets to evaluate postural weakness. How the Visualise Training Jacket works! Thank you! for joining the Visualise Canada news! We will occasionally send you information about upcoming clinics, new product or newsworthy facts about the emerging field of equine & rider biomechanics. Highly visible, Visualise Sportswear training jackets, & gloves are great for hacking your horse..
Analyze, evaluate and improve your performances with Objectivity - a user friendly video analysis app. Video analysis is used by athletes in all sports as a means to help improve performance and make marginal gains; video analysis is a proven method to help optimise performance. It is widely recognised that athletes can only recall certain amounts of information relating to their performance. Using video analysis, users can look at their performance in detail - with their coach, parents and friends - and make changes leading to improved performance. Objectivity is a user friendly app which allows you to video, store, analyse and share your performances.Download on ITunes. VIDEO - Lindsay Beer & her Advanced Horse El Paso demonstrating the Visualise Sportswear Training Jacket. Designed and developed by Russell Guire of Centaur Biomechanics. Great for multi sport use horseback riding, dance, cycling, running or skating.